This student was ordered to put the knives down and didn’t so the campus police officer did what he had to do to stop him from hurting anyone. A frightening scene unfolded Wednesday at a Reno, Nevada, high school. A student was captured on video waving knives and threatening fellow students before being shot by a campus police officer. Fox News chief correspondent Jonathan Hunt joined Bill Hemmer Thursday on America’s Newsroom to provide more details of the incident. Police responded to a call around 11:30 a.m. Wednesday at Hug High School following an apparent altercation between two students. Soon after, a 14-year-old male student armed himself with a knife. 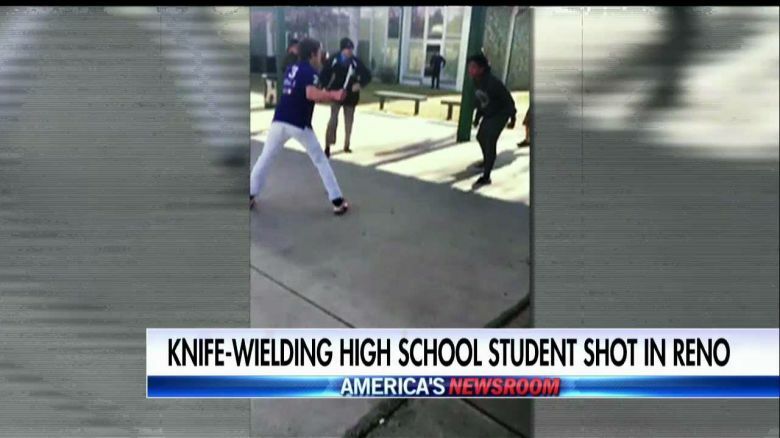 Additional photos and videos show the student appears to be carrying knives in each hand. Witnesses said the officer ordered the student to drop the weapons and shot the student in the shoulder after he refused. The school was temporarily placed on lockdown. The student was taken to the hospital and is expected to survive after being listed in critical condition as of Wednesday evening, according to local ABC affiliate KTNV. The campus police officer has been placed on administrative leave. Watch the above clip for more details.